For Rachel, her work with No Barriers is the perfect combination of her two passions: service and travel. Growing up in Minnesota as the sibling of a brother with disabilities, Rachel was given a unique perspective on what it means to live a life with no barriers. She was taught to always use the unique gifts and abilities she was given to reach her true potential and inspire others to do the same. Throughout her life, Rachel has spent much of her time volunteering; whether that meant jumping into a frigid cold Minnesota lake in the middle of February to raise money for Special Olympics or traveling to New Orleans to build Habitat homes after Hurricane Katrina, service was always an extremely influential part of her life. Her adventurous side began to develop after she was bitten by the travel bug during her study abroad in Chile, where she traveled along the coast to more than 16 different cities learning about the geography and culture of South America. Rachel was then inspired to earn her B.A. in Spanish Cultural Studies along with Communications and Journalism at the University of St. Thomas. Upon entering her final year of college, Rachel returned to to South America to explore Ecuador and volunteer at a shelter for families living in poverty in Quito. It was on this adventure that Rachel discovered the incredible impact travel can have on the human spirit and she decided to pursue a career that would help give others the same unique opportunity to explore the world and themselves. This career path brought her from the lakes of Minnesota to the mountains of Colorado, where she started as an intern for Walking Tree Travel and went on to lead students on two service programs to Costa Rica. She is now honored to be part of the No Barriers team and currently lives in Denver, spending as much time in the outdoors as possible. 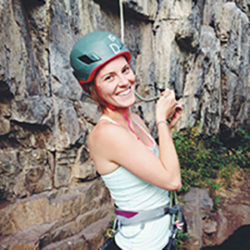 In her free time she enjoys rock climbing, practicing yoga, hiking, and skiing and is continuously challenging herself to learn new things and embrace the No Barriers mindset.